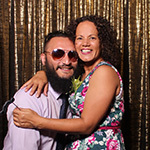 In the Booth loves providing photobooth hire in the Brisbane. Together with our neighbouring teams on the Sunshine Coast, Gold Coast and Toowoomba, we can cover the entire South East Queensland corner. Weddings, parties and corporate functions are the perfect opportunity to hire a photobooth and capture some fantastic memories with your guests. While Brisbane is a busy city with all of the hustle and bustle, it is also a laid back community renowned for its thriving cafe, arts and entertainment culture with water views both along the Brisbane River and coastal areas. 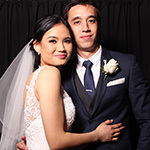 In Brisbane, photo booth hire is a perfect compliment for events, whether they be large scale entertainment events, corporate parties, personal soirees or loved up weddings. 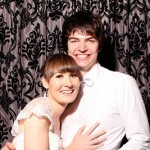 Hi, we’re Steve and Kate from In the Booth photo booth hire Brisbane! As well as running In the Booth in its’ birthplace of Brisbane, we are also the franchisors at In the Booth and are mum and dad to two growing kids, Isaac and Cassidy. Since In the Booth’s inception in 2009, we have worked together on building what has become Australia’s premium photo booth franchise which would simply not be what it is today without our wonderful family and dedicated franchisees. When we’re not busy with Brisbane photo booth hire, we are a close knit family with a big vision and an unstoppable work ethic. Nothing excites us more than hearing how In the Booth has been the most talked about item at our client’s weddings, parties and family celebrations. Nothing motivates us more than hearing about ways we can improve. Our award-winning booths have captured priceless memories for In the Booth clients all over the country and we can’t wait to capture yours. 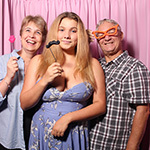 For any Brisbane photo booth hire enquiries please get in touch today! 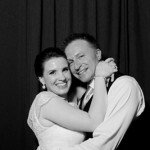 "Hi Steve and Kate, Dan and I just wanted to say a massive thank you for the fantastic photo booth at our wedding. The booth was definitely a hit- everyone had so much fun in there! It is fantastic looking back at the album as it is an awesome keepsake! Thank you also for the highlight reel and the digital image folio. The service you provide is outstanding and I will definitely recommend you to friends! Thanks again!" "Hi Steve and Kate, we have just received the package in the mail from In the Booth and couldn’t be happier! You both provide such a respectable and professional service and we are very impressed!! The guests at our wedding absolutely loved the photo booth (and you can definitely see the evidence from the happy snaps!). It was so popular all night my husband and I had to cut in the line just to get a photo of ourselves on our wedding day! Thank you again for your fantastic service and we will definitely recommend you to our friends and family!" "Hi Steve and Kate, Nige and I want to say thank you so much for the booth you supplied. It was the hit of the night and our guests loved it. As soon as they were let in the room, they were in there quick smart getting photos taken! The photos printed from the booth were wonderful quality and we loved looking through the guest book you supplied the day after the wedding. We will treasure these photos forever! The booth was beautiful and fit in very well with the décor of the ballroom our reception was held in. We saw a few booths whilst we were planning the wedding and none of them compared. The booth attendant on the night was lovely and very professional. He was also able to keep our more rowdy guests in check in a very polite and professional way which my husband and I really appreciated. We are so glad we booked with you and would recommend your booth and services to anyone. Thanks again." "Thank you so much! Dad absolutely loved the booth and he has been loving the pics so far. All our guests loved the booth too and have all been talking about it! It was a wonderful touch to his 60th birthday. Thanks again and thanks to our attendant Brenton also." "Just a quick note to say thank you so much to In the Booth. 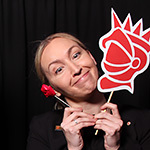 The photo booth was a great success with my daughter and her friends on Saturday night. The booth was kept busy all night! Special thanks to our attendant Toby for his patience and good humour, surrounded by noisy and over-excited 16 year olds all night!" "I would like to say thank-you for your services in making my anniversary event special. Everything about the photo booth was wonderful. We received our USB yesterday and I was pleasantly surprised at how professional everything looked. Thank you for the card. If I ever need a photo booth service again you will be the first place I come to. It was worth every dollar. Once again, thank you." "Hi Steve and Kate, thank you for sending the links through for the highlight reel, it looks really great! We have received our nice USB package also. We couldn't be happier with how everything turned out and In the Booth was awesome on our big night! Our guests loved it and we had a lot of good feed back saying the booth was heaps of fun (especially from my parents). 10/10! Thanks again for everything." "Hi team, THANK YOU THANK YOU THANK YOU! Thank you so much for your wonderful service yesterday. The day went off without a hitch and we had lots of people having a silly and fun time in your booth! Luke was an absolute legend and was just awesome from start to finish. He was super helpful and professional with all of the guests coming through! Can't thank you guys enough!! Looking forward to working together again. " 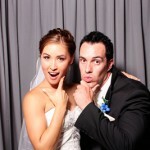 What is it you love about providing Brisbane photo booth hire services? Brisbane is a growing city with an old town heart and we love the diversity of the venues this brings. From the rolling hills of Sirromet Winery to the history of Customs House and the modern creativity of Cloudland, we find ourselves delivering photo booth hire at the most incredible Brisbane venues every week. It is such an amazing thing to be part of. Hearing from the bride and groom about how much the booth contributed to their guests and themselves enjoying their celebration is also a favourite! There is nothing better than contributing to a couple’s vision of their day and knowing that we were part of their long dreamt about day coming together. Tell us about some uniquely Brisbane touches you have seen at an event? We attended a Star Wars wedding once in a galaxy far far away… The bridal party were all dressed up as Jedi’s and Sith Lords, as were all the guests. Leia, Han and Chewy were there, and a Saber Arch guard of honour for the bride and groom to pass under featured as well. This wedding only narrowly beats the zombie apocalypse themed wedding… While these event themes might not necessarily be unique to Brisbane, they do highlight Brisbanites commitment to seeing their vision come to life in a BIG way. 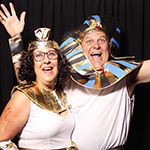 Bringing the fun in the form of photo booth hire to Brisbane events guarantees that we are part of something creative, unexpected and absolutely awesome! What we hear the most is probably more of a statement than a question – “wow, it’s so big in here!” When it comes to photo boothing we’re firm believers that size does matter. After that, it all comes down to choices. Our clients love asking about all the options we have to make the photo booth their own. From backdrops to print designs, every element is important and we love working with our clients to ensure the vision for their event is carried through to the booth. After all, that’s where your guests are going to be spending a lot of their time! Details, details, details. Being in the events industry means being obsessive compulsive about details and organisation, and you can never have too many lists! Get as much ticked off as you can early on in the planning and you will have time for if/when things don’t go to plan closer to your event date. Above all, remember the reason for your celebration and stay focused on that. It will make it easier to accept the things that might not turn out exactly as you planned. Go for a stroll around South Bank, see the Gallery of Modern Art, the Museum, and the Wheel of Brisbane (Brisbane Eye). Catch a CityCat ferry to Hamilton, visit the Eat Street Markets, and finish your day with a sunset climb of the Story Bridge.